I spent a month in Egypt when I was 18. Enthusiastic if not particularly knowledgable about food, I knew a little about Middle Eastern cuisine but nothing at all about Egyptian food; then and now, it is not much written about. Surprisingly, Claudia Roden, a native of Cairo, has never devoted a book to the subject. Perhaps history is too close to memory for her; perhaps she simply finds it boring. Anyway, my ignorance gave me a sense of exploration, of discovery – I found and knew less than if I had pored over guidebooks, but everything I did find was mine. Vegetarian at the time, idealistic and foolish, I regret not trying the brain kebabs that were sold on the corner of every block in Cairo, but everything I did eat still sticks in my mind – the Mubarak brand cheese (the former president was known as The Laughing Cow, for some reason) with milk rolls and eggs for breakfast, rice and black tea to get over a stomach bug, juicy papayas and sticky basbousa from the market below my hotel, tomato stews enriched with yoghurt, cumin-spiced lentil soup… Egypt has a good tradition of vegetarian food, largely from the Coptic Christian population and their elaborate calendar of fast days, and I was spoilt for choice. This was my favourite, though, and something I make all the time. A street food classic, there are diners all over Cairo serving this and nothing else, except maybe some rice pudding for afters. KUSHARI This has a few elements, but they’re all pretty easy, and some can be done in advance. To serve four. CRISPY ONIONS 3 large Spanish onions sea salt extra virgin olive oil Slice the onions into half moons, as thin as you can manage. You should be able to see through them. Put them in a colander, sprinkle over about a tablespoon of salt, and rub it into the onions. Leave for about half an hour. Rinse the onions, then squeeze out as much moisture as you can. 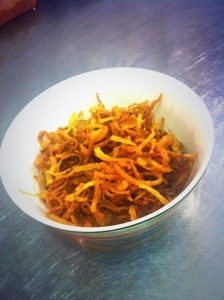 Heat a couple of inches of oil in a deep pan, and fry the onions in batches, swirling and turning often with tongs. They won’t seem to be getting anywhere, but will eventually (15 minutes or so) turn a lovely golden brown. Remove, drain on kitchen roll, and repeat with the rest of the onions. SPICY TOMATO SAUCE 2 tins chopped tomatoes 4 cloves of garlic, crushed 100ml red wine vinegar 1 tsp chilli flakes Put everything in a pan, bring to a simmer, and reduce until thick and intense. Season. It should be almost unpleasantly tart and hot. LENTILS 200g green lentils 2 bay leaves 1 head of garlic, halved Stick everything in a large pan, cover with twice the volume of cold water, bring to a boil, then simmer for half an hour or so until tender. Al dente lentils are disgusting; veer on the side of too soft. Drain and keep warm. MACARONI 100g macaroni Cook the macaroni. You could use another pasta if you like; I’ve used vermicelli, which works well. Macaroni is authentic, though, at least to the diner I went to. RICE 1 large onion, diced 1 tin chickpeas, drained and rinsed 1 tsp ground cinnamon a little fresh grated nutmeg a couple of cloves 500g basmati rice 1125ml of vegetable stock (knorr stock pots are good, but most other cubes and powders taste of dried herbs and salt – plain water would probably be better if you can’t go fresh) oil Heat a little oil in a large pan, and sweat your onion until good and soft. Add the chickpeas and the spices, and cook for a minute more. Stir in the rice, making sure it’s well coated in oil. Add the (hot) stock, and boil hard until well reduced, with a few pits starting to appear in the surface of the rice. Stick a lid on the pan, turn the heat right down, and leave for about ten minutes. Different brands of rice take different times, and the size and shape of your pan will make a difference too, so it’s difficult to be exact – just leave on the low heat until the rice is nicely cooked through. ASSEMBLY fresh parsley fresh coriander chilli oil or chilli vinegar or both Stir the lentils and pasta into the rice, serve up into bowls, and top each portion with spicy sauce, crispy onions, and a good scattering of herbs. Add chilli condiments if the sauce isn’t hot enough for you. KARKADAY They love hibiscus in Egypt, and drink it all the time as either a tea, or here, as a cordial. This recipe is adapted from Thomasina Miers, as they apparently drink something similar in Mexico. Makes a fair bit, but it keeps. 50g dried hibiscus flowers 300g caster sugar 1125ml water (that number again, strange) 2 lemons Put the flowers, sugar and water in a pan, bring to the boil, then simmer for about half an hour. Cool, then stir in the lemon juice. You might not want all of it, but it should be good and tart. This makes a cordial which is good with water, soda, and I imagine prosecco. I love cheese. I don’t think I know anyone who doesn’t love it, apart from the ethically- or physiologically-averse. One of my favourite things about travelling is eating different cheeses, the ones that haven’t made it to Britain – the aged peynirs of Turkey, the vast, stinking cohorts of France, even the bizarre aberrations the Americans are pleased to call cheese – and one of the first things I crave on returning is a good cheddar. I genuinely think British cheeses are some of the best in the world, with an astonishing variety and depth of tradition that is missing from much of our current food culture, cobbled together as it is from a glorious mishmash of sources, and they are also some of the most magical. The making of fresher, curd cheeses, for example, is fairly easy to understand – I’m halfway through making a white cheese at the moment, and it’s easy to see, once the separation of curds and whey has started, how the resulting mess could turn to feta, or ricotta, or whatever. To get from there to the fur-covered beauty of a Suffolk Gold, or the unctuous pungency of a Stinking Bishop, seems impossible. The alchemy of secret mould cultures, wraps of nettle or wax, aging in hidden caves… the transformation of the bacteria-riddled corpse of milk into a delicious sandwich component is pretty impressive. That whole process is a mystery to me, but there’re a few cheeses that it’s easy enough to make at home. The first cheese I ever made was from the Weird and Wonderful Cookbook when I was about 8 or so – it was a fresh, soft cheese, and I think I was disappointed, having expected something like a cheddar to emerge from that muslin bag. I don’t have that book to hand anymore. This, though, is an extremely easy and satisfying recipe that provided my grown-up introduction to cheese-making. I’ve read recipes that say USE GREEK YOGHURT and others that say NEVER USE GREEK YOGHURT, but as far as I’m concerned, using the strained stuff just does some of the work for you, so. I’ve made this literally hundreds of times, and it works for me. Chop the garlic finely then crush with a good tablespoon of salt. You want a smooth paste, with no rogue bits of garlic in your cheese. Add to the yoghurt with the rest of the ingredients and beat until well combined. Taste for seasoning, then spoon into a jam bag or similar arrangement – you could use muslin or a clean tea towel or probably even a t-shirt if you like. Whatever you use, you need to be able to hang it over a bowl in the fridge and leave overnight. What you do now is up to you. After a day, you’ll have a lovely cream cheese that is good as a dip, spread on toast, or dolloped on any stew where you might put yoghurt. After two or three days it should be good and firm – at this point you can roll the cheese into little balls, which can be rolled in herbs or spices, kept in oil and used as a mezze… That’s all a bit of a faff though, and I tend to just eat it at the soft stage. I think some of the best restaurants exist within imagined worlds. Sometimes this is simply the idealisation of memory – Russell Norman’s Polpo, for example, creates a version of Venice surpassing the original, largely from the raw materials of his own rose-tinted memories. Taken a little further, restaurants can provide an idealised version of something which never existed in the first place – to stick with Norman’s group, his Spuntino creates the perfect Italian-American neighbourhood bar, all bitter cocktails, mysterious shellfish, rich pasta and deep-fried treats, which would be unrecognisable to anyone who has endured a red-checkered red sauce joint in the wrong part of town. These restaurants, and others – Pitt Cue being a good example – are prime hipster locations, where context is an important as content. The food, while always strongly themed and very well executed, does not need to be groundbreaking as it is not the whole of the story. When you dine at Pitt Cue Co., you aren’t just eating pulled pork – you are imbibing a whole culture, of PBR, snap-back caps, beards, plaid and Southern rock – a fantasy of US barbecue culture that has already been filtered through East Coast hipster culture before it arrives here. Other, more interesting restaurants manage to apply this sleight-of-hand to an entire cuisine. Look at St. John and its subsidiaries. “A Kind Of British Cooking”, the recipe books tell us, and Fergus Henderson’s writing emphasises this, highlighting the skills and recipes he learned from his parents and grandparents while ignoring his own background in French classical cuisine, as well as the then-fashionable southern European influences he imbibed at the Eagle. The result, particularly, I think, at Bread & Wine, is a delicate fusion that dare not speak its name, a recreation of a traditional British cuisine that never actually existed. With all this in mind, I was thinking about the similarities – briefly mentioned, but never fully explored, in the Pitt Cue book – between American barbecue and Turkish cuisine. Both are cultures of pickle and smoke, of intense meat and charcoal cut through and balanced by crisp vegetables and sharp, sweet liquors. They even drink pickle juice as a pick-me-up in Turkey – although without the bourbon first. Imagine the perfect Turkish-American diner … the short-order cook a moustachioued usta, the hashes spiked with biberi pepper, the chopped salad laced with sumac … This dinner was the result of these imaginings. Pastirma is a Turkish dry-cured beef, similar to bresaola, but coated in a clay-like spice paste for the final stage of the curing process. Here, the same spices are turned into a barbecue dry-rub. Make up a brine with 1 litre of water, 120g of salt, and 15g of sugar. Immerse the brisket in this for three days. When it’s ready, dry it off with kitchen towel and leave in the fridge, uncovered, for six hours or so to dry further. Grind the whole spices and mix with the rest. 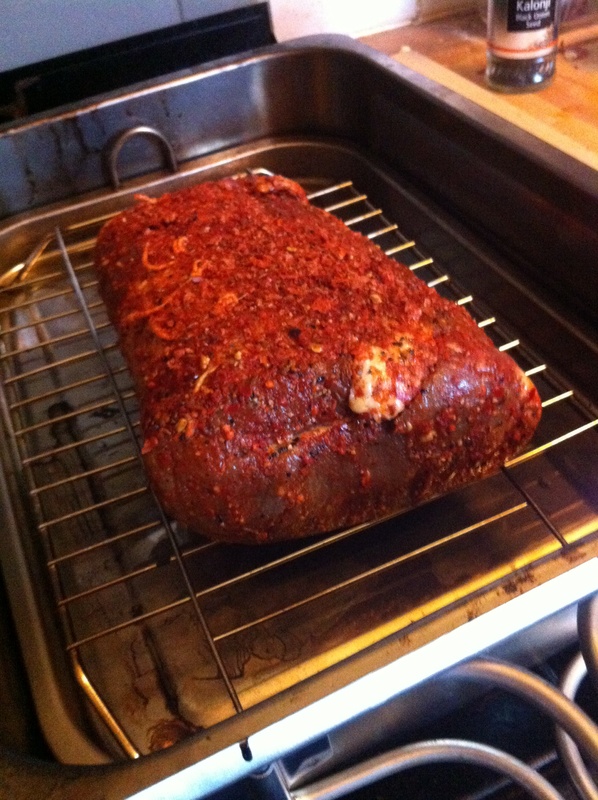 Rub liberally all over your brisket, wrap in clingfilm, and leave in the fridge overnight. This entirely depends on your cooking arrangements. I used a stovetop smoker, which I loaded with a mix of hickory and apple, and smoked the brisket for 2 hours before finishing in a low oven, covered, with a little liquid. If you have a decent barbecue you could do the whole thing on there; alternatively, you could do it entirely in the oven. It won’t be quite as tasty, but you could add some urfa chilli or even some smoke powder to the dry rub to approximate the flavour. Whatever way you choose, it’s going to take a long time, so you’ve got a while to get on with the sides. The Québécois pretend to a sort of European sophistication which eludes their dip-chewing, denim-clad, beard-sporting compatriots. Poutine, however, is their national dish. Make of that what you will. This is a happily bastardised version. Parboil the potatoes, then cut into whatever shape you like. Proper poutine is made with fries; I went for chunks. Oil, season, and stick in a hot oven. While the potatoes are roasting, make the gravy. Melt the butter (in a pan, obviously), stir in the flour, and cook until it smells nice and biscuity. Add your liquid a bit at a time, stirring, and simmer until thickened. When you’re ready to eat, pour the hot gravy over the hot potatoes and crumble over the feta. This is adapted from Rebecca Seal’s lovely book Istanbul. Slice the onion in half moons, then place in a small bowl, cover with vinegar, and sprinkle over a big pinch each of sugar and salt. Leave to macerate. Shred the rest of the vegetables. (If you’re doing this in advance, squeeze some lemon over the celeriac to stop it discolouring). Whisk the tahini, lemon juice and garlic together with some salt until it turns creamy. The tahini will stiffen and split; persevere. Stir in the yoghurt. A bit before you want to eat, mix together all the vegetables and dress with the tahini yoghurt. Let it down with a little of the onion vinegar if it seems claggy, and season appropriately.